Startups that serve small businesses can become massive successes. Shopify, MINDBODY, GoDaddy, Trulia, Zillow, and Yelp are just a few now-public companies that discovered and built multi-year relationships with hundreds of thousands or even millions of small business customers, which were were the foundation on which they scaled. And at Sapphire Ventures, we’ve backed some extremely successful SMB-facing companies such as Square and DocuSign. Yet despite these success stories, many VCs still shy away from companies that serve small businesses. Instead, investors gravitate towards teams that sell top-down into large enterprises at big-ticket prices — and fear that working with SMBs automatically means high customer acquisition costs, lower contract values, high churn, and lower profits. While selling small business buyers comes with unique risks, with the right tactics, you can quickly gain momentum. I am a firm believer that there is big opportunity in small business. This post outlines the three keys to success for companies that serve SMBs. When most of your customers pay only hundreds of dollars monthly or annually, you need to build a large base of customers to have a meaningful business. And to make sure your growth engine is sustainable, you have to keep your acquisition costs to a minimum. Leverage channel partnerships to extend your marketing reach and dollars. While these aren’t the only tactics, many of the biggest SMB success stories relied on them to launch and scale. The freemium funnel works best when your product has a large addressable market and low marginal cost. You need to create something of exceptional quality but also be able to deliver it to thousands, even millions, of new users without draining your resources. 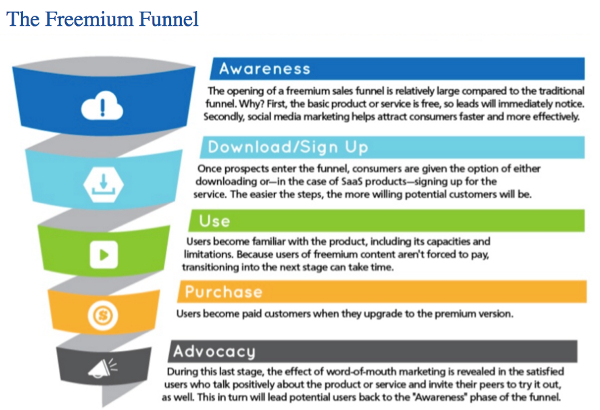 The freemium funnel often attracts 10x more SMBs than a traditional paid-only customer funnel since customers notice and adopt free products quickly and without friction. With some basic free distribution via SEO, mobile, and social media marketing, the number of people curious and willing to test what you’re offering can snowball. Trulia started with a free platform where real estate agents could build agent profiles and feature listings at no cost. These free tools attracted agents, built our brand, and brought valuable content to the platform. Over time, as more home buyers flocked to the site and participating agents’ deal flows increased, Trulia added paid subscription products and was able to charge more for branding, leads, customized profiles, and featured listings. By the time Zillow announced its acquisition of Trulia in 2014, Trulia had grown to more than 79,000 agent customers, each paying over $200 per month, netting us nearly $200 million in annualized revenue. Freemium isn’t the only inexpensive tactic for attracting customers. A user-friendly interface with low-friction sign-ups will help ensure that potential customers create accounts. From there, it’s more likely they will convert. GoDaddy excelled at this by putting its sign-up form front and center on the homepage. They also eliminated the need for users to input credit card info before registering a domain name and clearly defined the value of clicking through: “All the help and tools you need to succeed online.” Since users churn if they don’t quickly see the reason for testing a new product or service, spelling out a simple benefit is essential. GoDaddy’s process was fast and low-risk. When it filed for an IPO in 2014, the platform had already hooked 11.9 million customers. Using channel partners can significantly accelerate your growth while cutting down your cost of sales. Beware: building a successful partner channel is notoriously difficult as it can be hard to motivate a channel partner to sell your product as effectively as they sell their own. But if you choose your channel partner carefully and execute well, it can be highly lucrative. Guideline, which offers a simple 401(k) plan to small businesses, is a great example of an SMB-facing company that has successfully used channel partnerships to accelerate customer acquisition. Guideline teamed with several channel partners — including well-known cloud HR/payroll platform Gusto — to gain accelerate customer adoption. 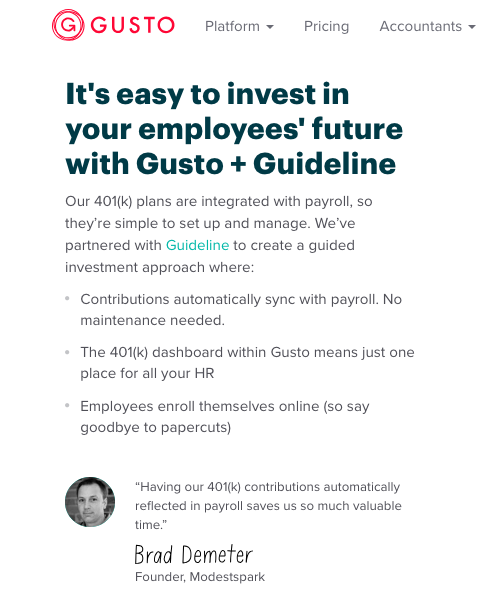 The key to success: Guideline’s 401(k) naturally aligned with Gusto’s core payroll product. Once SMBs sign up for a payroll service — especially progressive SMBs that use cloud-based payroll — 401(k) is a natural next product to set up. With channel partnerships, complementary products and a motivated partner are critical. Be smart and creative about how you reach your target audience. Once you figure out what works, then you can double down. Another common challenge with SMB-facing businesses is low ACV (average contract value). However, just like with any business, successful upsell and cross-sell are critical. Adding a second and third product that are complementary to your core product can increase customer value and reduce churn. 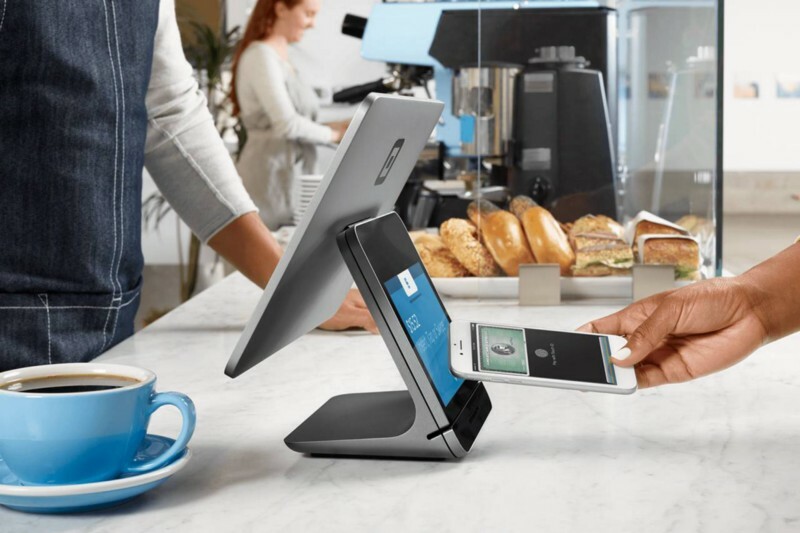 Square — a Sapphire Ventures portfolio company — is a prime example of a company that started small (with its simple white card reader) and consistently rolled out new products like reporting and analytics tools, next-day settlements for customer accounts, and more advanced point-of-sale hardware that have attracted higher-paying customers over time. In 2017, for example, Square launched the Register, a new PoS system aimed at larger enterprises. The Register combined the company’s hardware and software solutions in a single unit, which not only made things less confusing for growing companies but also offered better security, cloud backup, and touch display to improve the speed and quality of transactions. Large companies quickly adopted this solution. In Q2 2018, Square announced that 50% of the sellers on its platform had annual gross merchandise volume of more than $125,000 . 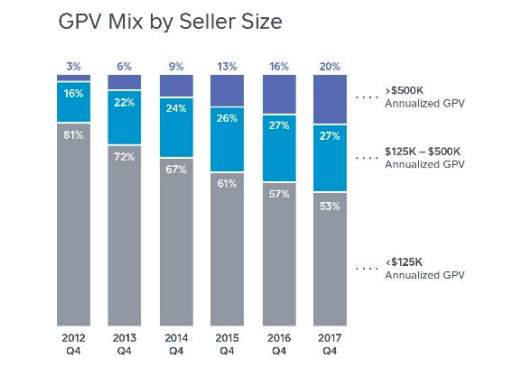 Similar product releases have helped Square increase GPV of existing customers, and steadily attract new customers with greater GPV for several years. Since Square calculates transaction-based revenue as a % of GPV, customers with higher payment volumes push overall account values to new levels. Another SMB-facing rocket ship, Shopify was able to increase its ACV by offering additional “merchant solutions” for larger retailers, including shipping services, support accessing working capital, and even a dedicated success manager for its largest accounts. Shopify Plus, its most robust plan, caters to companies as big as Nestle and Kylie Cosmetics. In 2017, Shopify had 3,600 merchants in its Plus program. While most of its customers pay just $50per month, the customized offerings in Shopify Plus helped drive overall ACV in 2017 to $92. Perhaps the most angst-inducing dragon that SMB-facing businesses must slay is customer churn. In an environment with low barriers to switching, your customers can’t just enjoy what you’re offering; they must depend on you. To increase retention and reduce churn, many successful companies have become essential by providing tools that integrate with their customers’ workflows, allowing them to gain a competitive edge and grow into larger, more established companies. MINDBODY is a great case to learn from. The company started as an appointment booking tool for wellness providers. As the space became more crowded, MINDBODY added marketing, staff management, and client relationship services to increase stickiness and avoid customers switching to competing software. Today, many customers rely on MINDBODY as a one-stop shop for scheduling, payments, marketing, and even product sales. One longstanding fitness customer remarked that even though they mainly use MINDBODY software for class bookings, knowing the retail functionality exists spurred them to expand their store. Once a company is familiar with MINDBODY’s initial services, it’s easy to continue to depend on them for years as they scale. Adoption of multiple products increases customer engagement and reduces churn. A final ace that many SMB-serving teams have up their sleeve is the ability to create network effects. DocuSign, another Sapphire portfolio company, is a prime example. At first, the tool was unfamiliar and cumbersome. A way to sign and deliver sensitive documents with electronic signatures — many SMB customers were dubious. Yet the more people used it, and the more other people used it, the more comfortable they became. If one party relied on it for a deal, the other would have to come up to speed to complete the transaction. In 2018, DocuSign had over 285,000 customers. The tool has become commonplace in deals, NDAs, legal transactions, and more. It’s a go-to solution that speaks for itself, with low churn based on its broad adoption across a network of users. Yet while SMBs may be more volatile to work with, the opportunity is massive, and SMBs can be more flexible and eager to try new tools and strategies. If you are patient and inventive with your go-to-market, thoughtfully and regularly roll out new products to solve your customers’ latest problems, and deliver services that truly help them succeed in the long run — you’ll reap rewards equal to or greater than any enterprise-facing team.